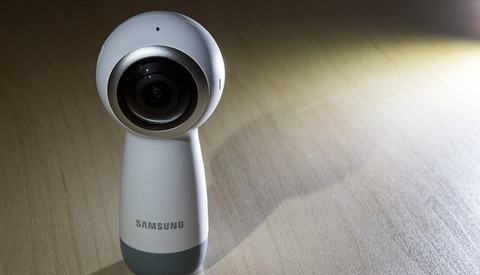 Ok, so remind me why this is so awesome or what ground breaking path this camera has paved? After moving to the Fuji systems, I find this a step in the right direction, but not a whole new direction in itself. I own both the Fuji X100s (for sheer joy of photography and super duper handy) and the X-E1 (with a few lenses for some serious work). The Nikon DF to me seems like the extremely expensive brother to an X-Pro1 or (to be fair as it has a full frame sensor) the Sony A7 (or A7r). Frankly, this doesn't super excite me after holding and using a fairly retro Fuji system. If I had the money (or 10 times the money), sure I'd try this out.. but for the time being, my Fuji(s) do the job just fine, while still bringing a lot of joy into the game of photography. When I first read Lee Morris' post, I realized that people like him are what wrong with photography, not the Nikon Df. Then I read this post, I realize that this is silly as well. The camera is equipped with a flagship D4 sensor and more focus point than you ever need, and the dials are brilliant and faster than menus or nikon's two buttons approach to change settings. Tell me why we can't have a tool we love and have passion for to grow our business? This doesn't have to be a vacation camera, or a passion camera, this can be your work camera. You can have passion during work you know? If you can do that, your work will get better. It's a Hyundai with a Ferrari body kit selling at Ferrari prices. Nikon is selling you the fluff. If you want to get nostalgic about photography and craft, get a manual slr for a fraction of the price of this and shoot film. They're just tools, use what you like. But, I'm not going to let someone repackage my youth and resell it to me at a premium price. Besides, my love of image making was never tied to any particular tools. It came from the process of making images. Yay! Finally someone who thinks like me. I am sooo tired of reading "it will make photography fun again" comments. When I hear that, I hear "I actually don't like my job"
I understand when people get burnt out though and don't like their job anymore. It happens, especially in the hustle to keep the lights on and you end up doing jobs just for the cash. Sometimes, the only thing that makes photography fun again is walking away from it for a while. It is not a Hyundai with a Ferrari body selling at Ferrari prices. Get your facts straight before you post next time. It's a largely re-wrapped D4. That is one HELL of a Hyundai! And if the wrapping is a Ferrari then it's a re-styled vintage GTO 250 and not an Enzo. The D4 might be a good camera, but really, is it worth over twice the cost of a D600 body. Don't get me wrong, I was really interested in this camera, but the innards do not excite me at all. You're also missing the point that there's a whole legion of photographers out there like myself who do shoot a lot of film on much smaller, lighter, vintage cameras. But when it comes to digital if you want to shoot the equivalent frame size you're left will the oversized bulk and weight of the Canon 5D Mark IIIs of the world. Photographers that want a small everyday carry type of camera look to the Sony A7r, Nikon Df, or Leica M if you can afford it. Size MATTERS! And in this case the smaller the better in my opinion. This is a very positive step forward from Nikon. 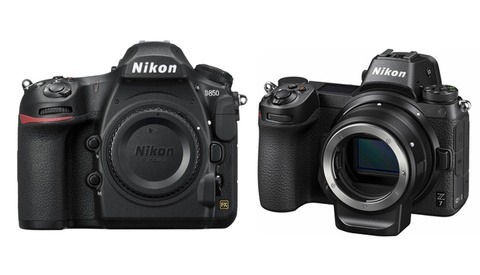 Buy a Nikon D600 then and save yourself about $1500. The way I understand it you're getting the guts of a D4 for half the price but lose a few features like video. I'm sure someone will write a memory card hack too. I personally pre-ordered the Sony A7r. The Nikon looks like a great manual camera which is how I like to shoot but the A7r is much smaller. Yeah and the D4 is a great camera. But I can buy an A7R and 55mm for the price of the body, though the hybrid AF is on the A7 and that's probably enough pixels for me. I'm going to shoot with Leica and Zeiss ZM's so the focusing wasn't a sales point for me. Lack of Anti-Aliasing filter and higher megapixel made the A7r the one for me. I do think Nikon didn't price this body aggressively enough, as in lower and more attainable. If they had bundled a lens and camera for 2200-2500 people would be singing their praises more. Ahh, sounds like a nice set of primes. I believe Nikon use same sony in the D600 D610 as is in the A7 and the A7R is the sensor in the D800 probably. All of these comments make me really sad - so sad that an old school camera body will "make shooting fun again" for all of you. Shooting pictures has never, eveer, stopped being fun for me. Even in the most awkward or stressful situations, I am happy. Why?? 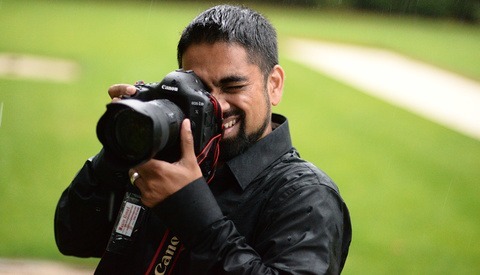 Because I am doing what I love for a living....it has nothing to do with the camera. At least you sound really satisfied with yourself. It has a lot to do with the camera. I am also a painter and let me tell you that it is very different to go from oil to acrylic to ink, different brushes, to paint on canvas, steel or wood et c. Any fine art photographer will tell you that the camera has massive impact on the flow of work and so on. It's very different to use a view camera and spend 25 minutes on a single frame, looking at your subject upside down, standing under that dark cloth looking at the huge glass. 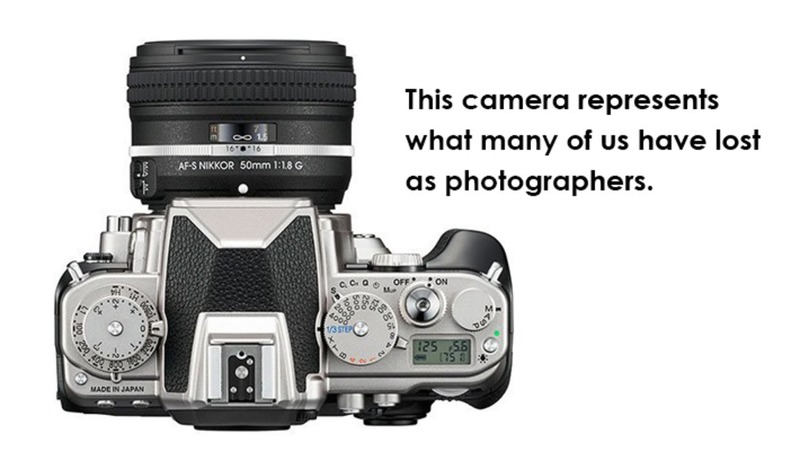 Very different from using a handheld snapshot camera like a modern dslr. It is very different to use different sets of buttons, feel them. I feel sorry for you who don't seem to be sensitive to the world or the things you engage with. For me photography is a tactile affair. Touch matters immensely. I can't use so called modern cameras. I make horrible work with them. But I would never judge other people who love those types of cameras. When there finally is a proper tactile camera that many have longed for you think that the joy people express about that camera is sad. Really? Why not celebrate that there is now more choice? More people are happy? Or are you sad that there are people not like you who think differently? What you said kinda throws me back to that "the camera shouldn't make the photographer" thing, somehow. It's like Nikon is trying to sell the idea that you should buy this thing in order to get in touch with your inner (and true) photographer. Seriously? lol By february they'll release a 2.0 version with 4k video and a coffee machine integrated. I think the Nikon Df will make me fall in love with photography all over again. Or, it could serve as a serious workhorse camera for stills, and also at the same time, make me fall in love with photography all over again. "I think the Nikon Df will make me fall in love with photography all over again." --&gt; I dont see how you would Need a specific camera for that.. Honestly for me, now I don't care which camera I use as long as they help me get the job done. They are like total tools that has no life. I shoot, I finish, I put it in the bag. I don't see them until before the next job and I DON'T want to see them until before the next job. But, looking at this camera, it made me feel like I want to see and hold it every day. Like the first time I first started before becoming a full time pro. And if Canon makes one too, I would seriously go for it too. I would seriously consider buying these big boy toys, because they are supposed to be like toys, not tools. Because as a kid, I would take my most beloved toy wherever I go, but a tool, I only take out when I need it for a task. But the Nikon Df is a bit special. It can be both a toy and a tool. The Fuji X100s has video, very inexpensive, has an awesome retro look and is PERFECTLY sized for simply walking around and enjoying photography (the basis of your argument). This Nikon DF could have paralleled that, but it didn't. It's a $3000 DSLR with a cumbersome an bulky shape, lacking features which are standard to other cameras in the price point. The simple fact is this camera is $1000 extra for the pure look of the thing. I really wanted this camera to be an interesting piece of kit to supplement my gear as the Fuji X100s did for me. That being said, people spend $8000 on a Leica with even LESS features and no lens included and do so happily. Nikon will sell many of these DFs. Shooting my X100s all day long yesterday reminded me I don't need a new Nikon retro camera with botched design. the day i bought my x100s I stopped bothering with my DSLR. I didn't touch it for months... Only to shoot a wedding with it, yet I used the X100s as a back up for the wedding. Worked great. Love the tone of your article! I encourage people to pick up a camera, rather than shun them from inside an elite club... I want to share this joy at whatever level. When you take a photo, it's about savouring moments. My mom took technically awful photos of my childhood that I cherish. Being angry about trendiness is ridiculous, and reeks of insecurity. I have a problem with the Df and it's nothing to do with anything Lee said. I've slimmed down my own gear to my film rigs and my Leica M because I just shoot better that way and I have way more fun that way. My problem with the Df is that it doesn't seem to know what it wants to be. It has this retro body, a manual shutter dial, but then doesn't ship with a lens (or at least, in publicity images) that has a manual aperture ring? That seems like a mistake. The Fujis and the A7 seem to have nailed down this sort of rig way better than Nikon seem to be doing. Those cameras know exactly what they're going for. I like that.